Does your house look dirty? Clean it! I grew up in a house with beautiful grey vinyl siding. Every year my dad had it cleaned even though I could barely notice any dirt. He always told me that it was because he wanted to be ahead of the problem before it got too bad and the house looked dirty. Three years after my parents sold the house we drove by to see it, for memories sake. I was heartbroken by what I saw. The house looked awful. The new owners had made some changes to the landscaping that was odd, but the big difference was dirt that had built up on the vinyl siding. It was awful. At that moment I knew my dad was right about his commitment to cleaning the siding (although I’ll never admit it to him). 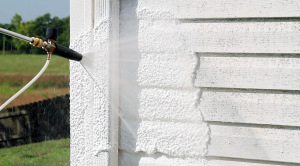 Pressure washing vinyl siding is important with respect to keeping your home looking nice and making the siding last longer. That being said, it is important to have a professional do it so as not to damage the siding. Pressure washing is named that for a reason, it has a lot of pressure. If you aren’t familiar with the machine and how it works, it is very easy to gouge dents and holes into siding which could lead to moisture and mold build up underneath. At Renew Crew, we use a foam on the side that loosens built up dirt and grime. Seen here, the foam sits on the vertical surface just for a few minutes. Once the foam has had a chance to work its way through the dirt, we use non-damaging pressure to remove the foam and dirt. Look how effective it is. 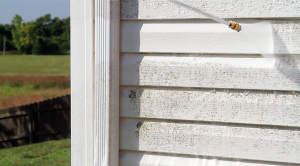 Vinyl siding should be pressure washed on a regular basis depending on the outdoor elements. Call your local Renew Crew office to receive a free estimate.